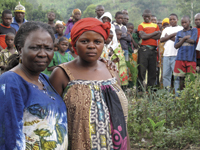 North Kivu, in eastern Democratic Republic of Congo (DRC), has been described as one of the most dangerous places in the world to be a woman. Since 1998, as the Congolese army has battled against a number of rebel militias, 5.5 million civilians have been killed and more than half a million women raped in the country. It is estimated that the conflict is now bloodier than any since World War II. We follow Dr. Grace Kodindo - known across the world for her fight to stop women dying in pregnancy and childbirth - as she tries to find out what help is available for the people affected by the fighting. Do the women here have access to the emergency services, health care and specialist drugs they need? Grace talks to doctors, nurses and ordinary people to find answers. "Grace Under Fire is a stunning film, mixing the beauty of the Congo with the tragedy of war. Dr. Grace Kodindo is our experienced guide to the many reproductive health problems faced by women in conflict zones. But even Dr. Kodindo is moved and shocked by what she sees and hears from the women, men and health workers. This half hour film is a condensed course in reproductive health and rights, and makes a convincing case for improving services for women in such situations." "[Grace under Fire] challenges us to think about global healthcare disparities and how to address them. One argument of Dr. Kodindo is that certain healthcare interventions, such as delivery kits, are low-cost but highly effective in saving lives. Focusing on low-cost simple medical technology may be the answer to some global health threats." "Grace Under Fire is a compassionate expose...Dr. Kodindo's empathy and passion parallel the pressing need for women's protection from sexual violence and access to adequate health care in this compelling documentary. This film would be a welcome addition to any Women's/Gender Studies, African Studies, or Black Diaspora Studies curriculum. It highlights not only the impact of the Congolese war on civilians, but also the dire need for efforts to ensure that women and children have access to most basic forms of medical care."